ABC/Lou RoccoUndeterred by Iggy Azlea‘s rising star, Nicki Minaj continued to dominate hip-hop throughout 2014. At the top of the year, the rapper kept fans satisfied with random freestyles, including “Chi-Raq” and “Yasss Bish! !” as she continued to record her much-anticipated album, The Pinkprint. When she wasn’t recording, Nicki was busy promoting her first role on the big screen, when she played Cameron Diaz’s assistant in The Other Woman, which opened with strong reviews in April. 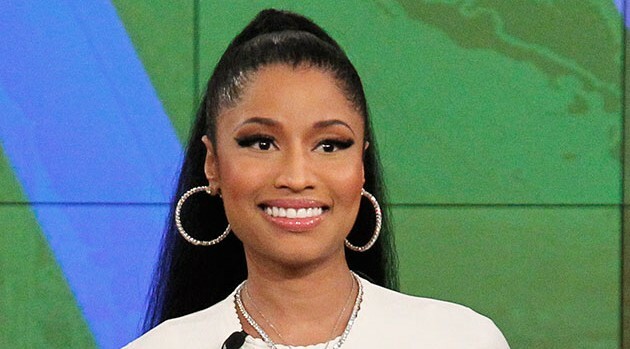 It wasn’t until June that Nicki gave fans her first official single, “Pills n Potions,” an emotional track about relationships, with Game making a cameo in the video. That same month, Nicki made headlines for throwing shade at other female rappers — yes, Iggy — while giving an acceptance speech for Best Female Hip Hop Artist at the 2014 BET Hip Hop Awards. Fortunately, though, the rumored enemies cleared the air after running into each other backstage at the 2014 VMAs in August. For the remainder for the year, Nicki perfected her shock and awe tactics as she began the roll-out for her third album. She practically broke the Internet with her racey “Anaconda” cover art, in which Minaj exposed her booty while wearing a pink G-string, halter top, and blue Jordans with her back facing the camera. She remained the talk of the Internet after she gave a lap dance to Drake in the accompanying video for the platinum-selling song, which samples Sir Mix-a-Lot’s 1992 classic “Baby Got Back.” Not surprisingly, the clip broke a Vevo record, racking up 19.6 million views within the first 24 hours following its release in August. “I specifically wrote the verses [for ‘Anaconda’] in a very sing-along way,” Nicki said in an interview with Billboard. “No matter how raunchy it is, it’s still playful. The sample was already such a classic in hip-hop; it’s scary to touch a classic. But Sir Mix-A-Lot gave me his blessing. He was like, ‘If anyone can do it, it’s you. '” Minaj’s “Anaconda” rode to the top of the Hot R&B/Hip-Hop Songs chart for a six-week reign. But one of the most unexpected surprises that came from Nicki was that she recorded not one, but two songs with Beyonce. In August, the pair quickly became a trending topic on Twitter with their “Flawless” remix, followed by the official video, which was filmed during Jay Z and Bey’s On the Run tour closer in Paris. Nicki and Bey also collaborated on a track called “Feelin’ Myself,” lifted from The Pinkprint, which in on pace to top the Billboard 200 chart with projected sales of over 155,000 to 165,000 copies in its first week, not including an added 15,000 from album streams. 2015 will see Nicki embarking on her recently-announced international outing, dubbed the The Pinkprint Tour. Alongside Trey Songz, the duo will begin their trek in Europe starting March 16, 2015 at The Globe in Stockholm, Sweden. They’ll make stops in Amsterdam, London, Paris, and Dublin before wrapping up April 12 at the Hydro Arena in Glasgow, U.K.